When you vote you also get entered to win Kindle copies of both books. We will have one winner who gets them both! 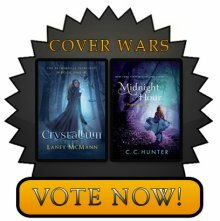 The winning cover for this Cover Wars event is Midnight Hour by C. C. Hunter! This was a really close vote. Crystallum got 58 Votes & Midnight Hour got 61 votes. After captivating millions across the globe, the Shadow Falls saga reaches its final—and most unforgettable—chapter yet! Prepare to fall in love all over again. . .